Capital of the government of Smolensk, Russia; situated on the Dnieper, 250 miles west-southwest of Moscow. Jews resided there as early as 1489, for a letter of that date from Grand Duke Ivan Vassilivich to King Casimir contains a complaint that the Jewish customs collectors Shemyak, Novar, and David had extorted the sum of 63 rubles from Ignat Verblud, a merchant. 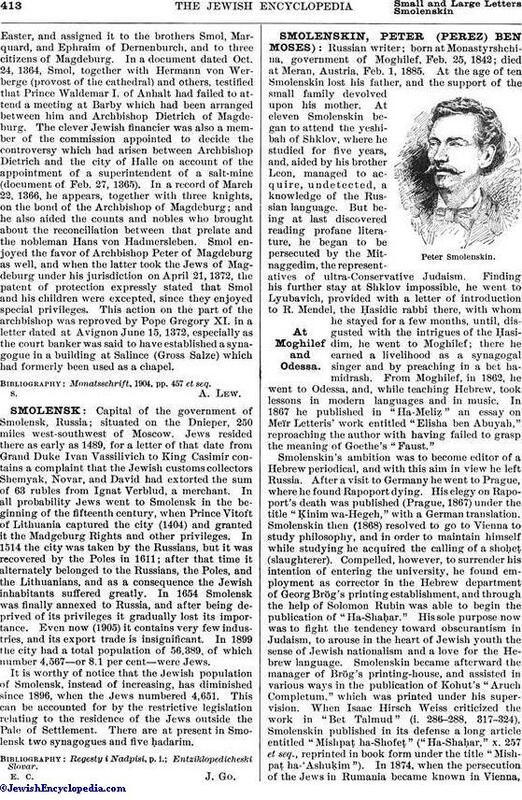 In all probability Jews went to Smolensk in the beginning of the fifteenth century, when Prince Vitoft of Lithuania captured the city (1404) and granted it the Madgeburg Rights and other privileges. In 1514 the city was taken by the Russians, but it was recovered by the Poles in 1611; after that time it alternately belonged to the Russians, the Poles, and the Lithuanians, and as a consequence the Jewish inhabitants suffered greatly. In 1654 Smolensk was finally annexed to Russia, and after being deprived of its privileges it gradually lost its importance. Even now (1905) it contains very few industries, and its export trade is insignificant. In 1899 the city had a total population of 56,389, of which number 4,567—or 8.1 per cent—were Jews. It is worthy of notice that the Jewish population of Smolensk, instead of increasing, has diminished since 1896, when the Jews numbered 4,651. This can be accounted for by the restrictive legislation relating to the residence of the Jews outside the Pale of Settlement. There are at present in Smolensk two synagogues and five ḥadarim.